Illustrated winery map of the regions of Vineland, Jordan and Pelham will soon be available at the wineries in the illustration. Each winery was lovingly hand painted. This map is for decorative purposes. The wineries are accurately placed, but scale is larger. 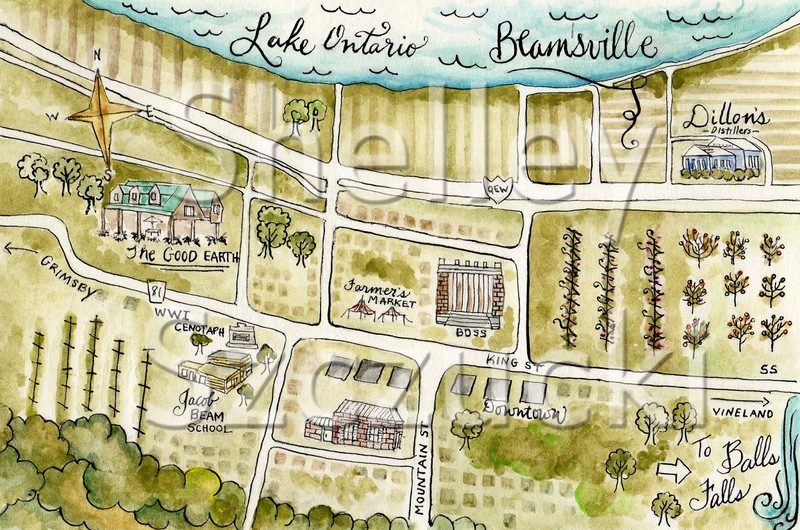 Labels: "Calamus Winery" Vineland Winery map" "Vineland estates winery"
Beamsville Print and Postcard is READY! Beamsville Postcard is ready in a 5x7 post card and 8 x 10 print. Ready to purchase at wineries listed above. More wineries to come soon! I will be updating with names of places that are carrying these prints so that you can purchase from them. If you are out of the area I can mail the prints to you by emailing my at shelli170@msn.com. 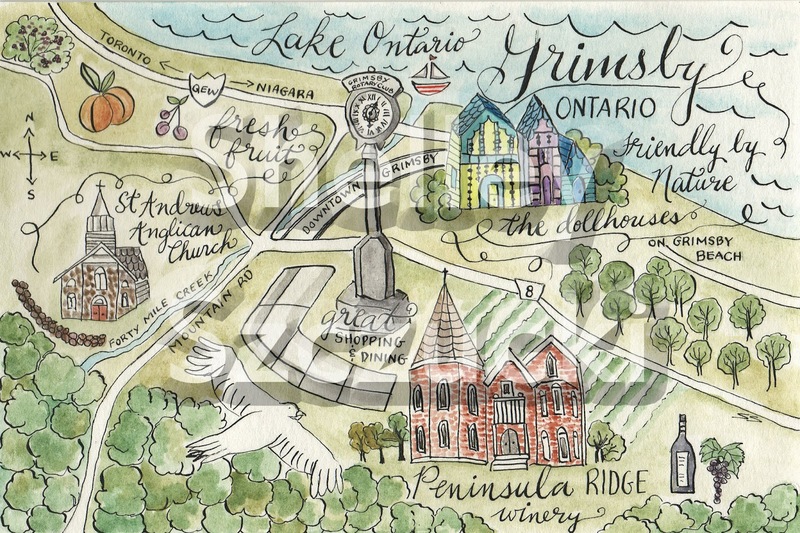 If you are getting married in Beamsville or anywhere......email me to get a quote on a personally designed map to your location. Please use wedding map in your subject line. Or visit my etsy store and leave a message there. Grimsby Ontario Postcard available for order. I chose to incorporate the landmarks you see purely because they were my choice. 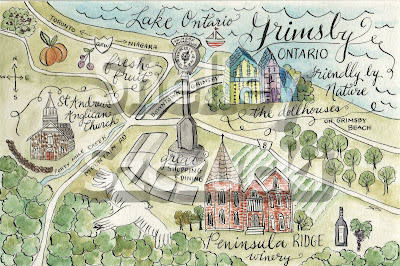 Peninsula Ridge Winery's address is actually in Beamsville, that's why it will be included in my newest Beamsville map. It's right at the edge of Grimsby. I was married there so holds a special place in my heart. I just love the whimsical nature of the houses in the beach area and they were perfect for my art style. I included St Andrews because it's an historic landmark for Grimsby. I totally understand I missed so many great places in Grimsby. This map was an illustration of a few of the many local places that are my choice. Please feel free to comment and let me know what local places you would like to see illustrated.